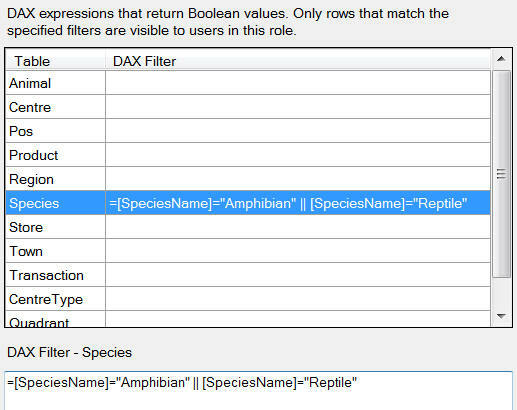 In Analysis Services you restrict access to data by creating roles, and then setting row filters controlling what each role can see. Read on for how to do all of this! 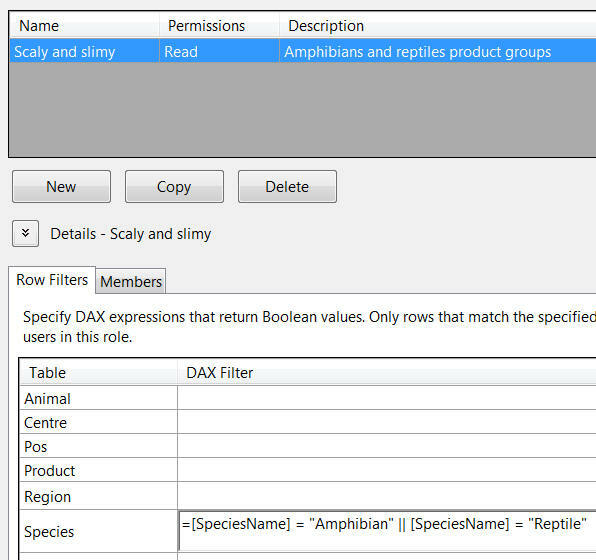 People in the Scaly and slimy role would see amphibian and reptile data only. Select this menu option while editing your model. The 3 roles we're trying to create. 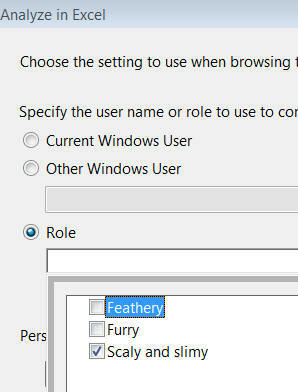 Click on this button to create a new role. 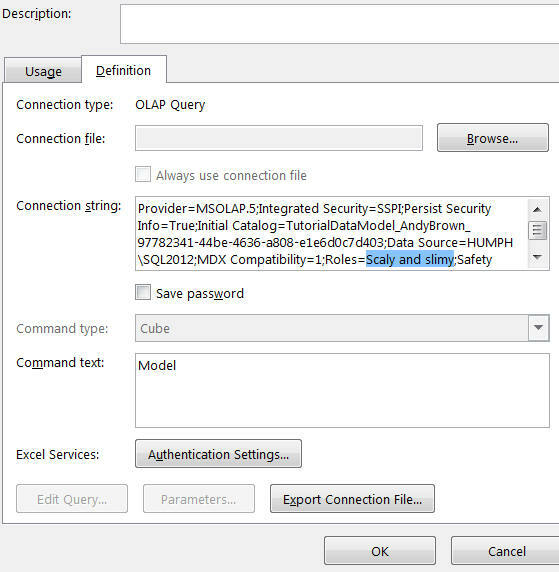 We'll allow people in this role to view data, but not to process it (ie not to load it into the model). The next stage is to say for each role what data it should be allowed to view. 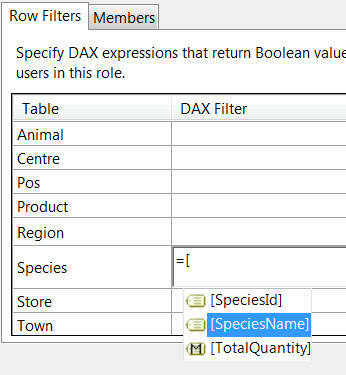 By default, members of roles will be allowed to view any data in your model (in this respect SSAS Tabular works in the opposite way to SQL Server, where a user starts with no rights). You can use double-headed arrows to widen columns and (as shown here) to make rows higher. 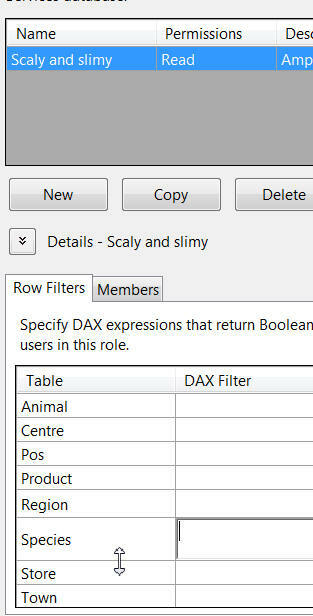 After typing =, you can use the usual DAX punctuation characters to make filling in a formula easier. Note that use of the double-pipe || to denote "or". 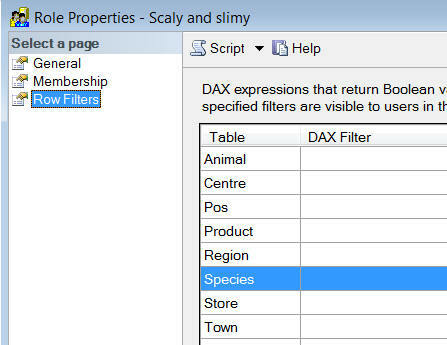 That is, allow people in this role to view any row of data if it's for an amphibian or a reptile. 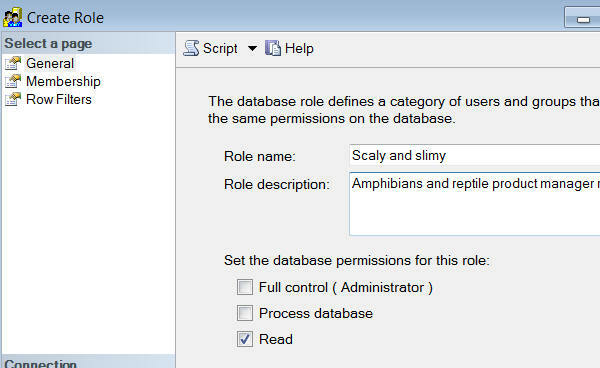 Assuming you've set up 3 roles, choose to use the Scaly and slimy one. 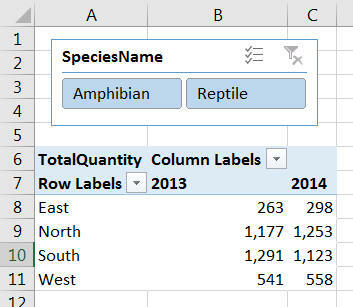 No matter how you slice your data, it will be as if Mammal and Bird data didn't exist. 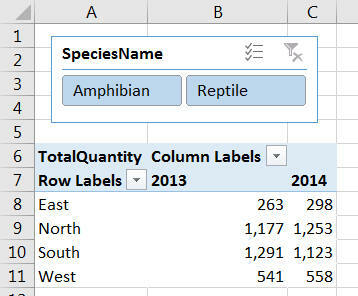 You can manually edit the connection created for a pivot table to use a different role, as shown above. 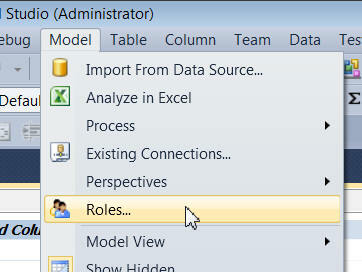 Right-click on the Roles category within a model, and choose to create a new role. 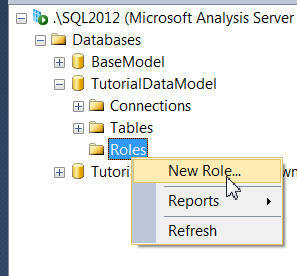 Here the role will be able to read data only. The problem is that you don't have the intellisense available in Visual Studio, so you have to type in the formula without help. Fingers crossed I've got it right! 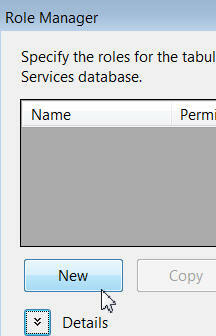 You probably don't want to keep going into Visual Studio to manage your roles, so the next thing I'll show is how to create a permissions table in SQL Server controlling who can see which rows.